The sharing economy is shaking up every industry from top to bottom. For the moving industry, it’s nothing new. People have long borrowed a friend’s truck or organized potlucks for members of their church when it came time to move. Moreover, larger companies have offered rental trucks and other equipment for decades. As such, these factors don’t pose a significant risk to the industry. In many ways, the moving industry has participated in the sharing economy since long before it was named such. Rather, the changing American landscape and increasingly frenetic pace of modern life create opportunities that moving companies can take advantage of. The following are some savvy strategies moving company operators can use to grow their business as the economy evolves. In particular, by providing mobile storage solutions. 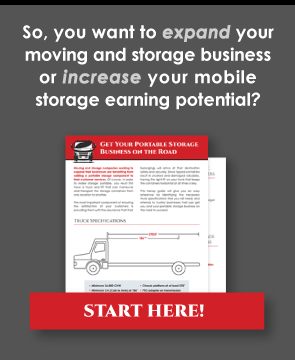 Consumers are looking for quick and easy solutions to their moving needs and mobile storage provides it in spades. Containers can be dropped off, loaded, hauled away, and delivered with nothing more than a couple of phone calls. Operators wanting to add to the convenience can offer to load and unload the container. This takes a huge weight off the shoulders of customers with a load on their mind. The convenience you offer also extends to your web presence and payment portals. Making it easy for customers to track their possessions and pay for the services you are providing will go a long way towards boosting your brand image and the sales you generate. The latest and most attractive equipment can be expensive to purchase. The sharing economy means that it is often possible to purchase used containers, trucks, and other equipment. This equipment can be refurbished and made to look new at a fraction of the cost. In the sharing economy, cutting the cost of doing business is the best way to remain in business. Americans have a lot of “stuff,” and they are acutely aware of it when it comes time to move. Moving companies can help consumers offload their extra stuff by offering consignment services, hosting “yard sales,” and hauling stuff that can’t be sold to the dump. These value added services give you a leg up on competitors who merely move customers from home to home. The sharing economy creates a network of information and leads. Cultivating partnerships and affiliate networks gives you a direct line into a vast number of leads and potential customers. For moving company operators, the larger the network of partners and affiliates, the greater the financial rewards. YouTube, Instagram, Facebook, and other social media channels are free to use and provide a fast way for consumers to look up moving tips and information. By creating short, easy to understand videos, posts, and apps, you can help consumers prepare for their move by teaching them everything from how to pack their possessions efficiently and safely for transport, how to settle into a new community, things to expect when moving, etc. In the sharing economy, moving companies that share knowledge, skills, and useful information have a considerable advantage over companies that hold their cards close to their vest. The sharing economy is nothing for moving company or mobile storage operators to fear. The moving industry has long since participated within it. Adapting new technologies, platforms, and adding value to the services offered are the keys to success that every operator can grasp and use to unlock the vast potential that America’s mobile landscape has to offer.